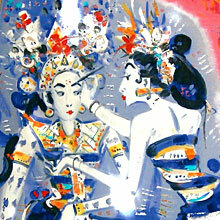 He is founder member of the Sanggar Dewata Indonesia artists group there in 1970. Gunarsa has opened his own art museums in Yogyakarta and Klungkung. He has held solo exhibitions in Indonesia, Malaysia, Australia, the Netherlands, Japan, Singapore, France, Monaco, and the USA. The artist won the Pratisara Affandi Adi Karya art award in 1976, prizes in the Biennale - III Jakarta in 1978 and Biennale - IV Jakarta 1980, and the LEmpad Prize for art in 1980. In 1994 he received the Dharma Kusuma cultural award from the government of Bali, and the Satyalancana Kebudayaan art award from the President of Indonesia in 2003. His works are documented in the books, The Play of Line and Color of Nyoman Gunarsa (1993), Nyoman Gunarsa (1995), and Nyoman Gunarsa Moksa (2004). He now lives and works in his home village. Gunarsa first painted in a academic style before he started doing expressionistic works in the 1980's. “I am drawn towards lines like singing and placing colours like dancing”, says the artist. This is the basis of his creative concept, namely rhythm. His paintings are developments of forms which he mastered while doing earlier in this career. They are more expressive with dynamic figures that show his concept. In The Flute Players in White, the three women are shown with lines and colours that give the rhythm and Feeling of The Music. The plain faces and upper bodies of the women are contrasted with lively lines and contrasting colours in their clothing and in the background. The painting has a sense of rhythm in the positions and repetitions of the figures.